What are Partials and Dentures? Denture: Dentures are a replacement option for all the teeth in either the upper or lower arch of the mouth. It is removable. Partial Denture: A partial denture is a replacement option for teeth when a few are missing. It is also removable. Denture: A patient may currently have a denture and want it replaced or may have some remaining teeth that are experiencing toothaches, are unhealthy, or are not aesthetically pleasing. This full denture would require extracting teeth and then replacing them with the denture. Partial: A patient may want a partial when they are missing some teeth and would like additional teeth to chew better or improve their smile. 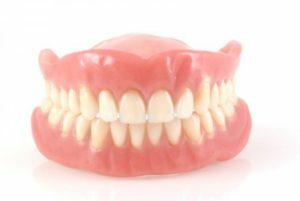 What do Dentures and Partials cost? 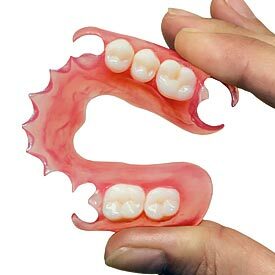 Denture and Partial: Both dentures and partial dentures cost from $300 to $5,000 for a plate and from $600 to $10,000 for a set. Dental Implants may be used to help hold in the dentures and partials in place. A re-line procedure is required when the bone underneath the denture or partial has changed and needs to be re-lined to fit the mouth. A patient will need strong supporting adjacent teeth for a dental bridge. This option is more expensive and requires a more invasive procedure. A patient’s bone quality and quantity will determine if this is an option and how expensive the procedure will be. It is a fixed porcelain unit that screws into place and cannot be removed with out specific equipment. The difference in price for this unit is about $30,000. A patient may choose not to replace their missing teeth when a denture is uncomfortable or they cannot afford the costs associated with it. Someone choosing this option should not have many other dental problems, should practice good oral hygiene, and have healthy remaining teeth. Talk with your dentist about which teeth replacement option is best for you, and visit Intelligent Dental for more information about alternatives to dentures and partials.